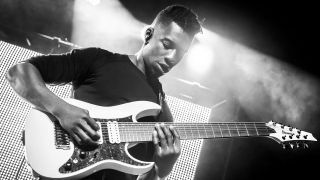 When it comes to pushing the boundaries of technique, Tosin Abasi is constantly raising the bar for the current generation of metal guitar players. By drawing inspiration from many styles, consciously avoiding clichés and staying true to his musical integrity, Tosin has sculpted a unique sound and style of his own. Here we delve deeper into some of Tosin's techniques, as he demonstrates ways to combine hammer-ons with alternate picking, tapping over fretted chords and methods to play chords and melody lines simultaneously. And although he's playing an eight-string guitar, he only uses the top six strings throughout these examples, so six-stringers can easily try out his techniques. We've even kept the tab in six-string format to keep it easy to read. Here Tosin plays a triplet idea using a repeated fretted note to outline a 'hammer-on, downstroke, upstroke' pattern. Squares denote hammer-ons played without the string being picked. Playing on the beat without your picking hand acting as a metronome can take some getting used to so practise slowly until you get a feel for it. In this exercise Tosin repeats the triplet rhythm and picking pattern but with a melody line. There's a fair amount of string skipping going on, so start slowly and focus on keeping those triplets steady. Practise small sections such as the first six notes of bar 1 before putting the whole line together. Tosin takes the concept a stage further by introducing more hammer-ons. Memorise the fret-hand pattern because this makes it easier to pick in the right places. Here Tosin frets an Emaj7 chord while tapping a series of two-note chords. Keep the chord held down throughout so the notes sustain across each other. In this exercise you'll need to be accurate with your tapping fingers so that the strings you've just tapped are left ringing when you move to tap the next string pair. Tosin plays these triplets with a 'tap, tap, pull-off' pattern. Be careful not to drag the string upward or downward when releasing the first tapped note. This time slides are added to certain tapped notes. Don't worry about the unusual time signatures - just play a steady stream of notes that are all the same length.